The Erie Canalway is legendary in American history. It was an early version of the modern interstate highway in that it was a principal means of commercial transportation and passenger travel in the 19th century. The canal covers 363 miles and was created between 1817 and 1825, opening travel between the Hudson River in Albany, N.Y. and Lake Erie at Buffalo. 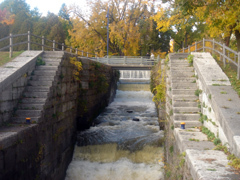 With the canal opening in 1825, upstate New York developed quickly. Tremendous economic growth was experienced in cities along the canalway and the Hudson River all the way to New York City and the Atlantic Ocean. It remains a beautiful part of Upstate New York as well as a center of recreation and activity for residents and visitors alike. The Erie Canalway National Heritage Corridor preserves this piece of American history today. We hope you enjoy reading about this important historical region.